THE SPOTTED HARE: A Simple Christmas . . .
A Simple Christmas . . .
Do you ever wish to return to a simpler, less harried Christmas time? I'm not sure if it is even possible but we keep trying ! After a busy, busy sewing season it's difficult to have enough energy to decorate and bake, so we have simplified our routine a bit over the last few years. Yes, I still decorate, but it's mostly simple greens and candles. Yes, I still bake . . . I love it, but I don't worry about having 10 kinds of cookies . . . 3 or 4 favorites will do! So . . in this spirit I would like to share one of my favorite decorations of many years! 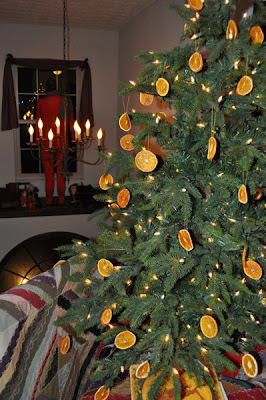 I dry orange slices to adorn our tree . . 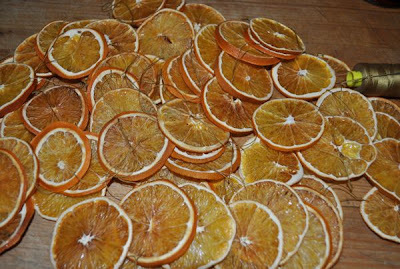 I set aside a day to slice and to dry them in the oven. The smell throughout the house is wonderful! 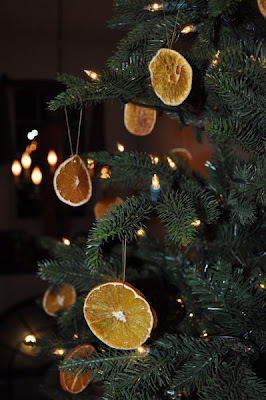 Once dried, strung and on the tree s they catch the light and reflect a warm candle glow color! Here's how! Set oven at 200 degrees. Line cookie trays with foil. Lie them on cookie sheets and put into oven . . after about an hour turn them over. Then maybe after 30 minutes, check and turn again if need be. They should take about 2 hours, but everyones oven heats a little differently. After about 1.5 hours check often as they can brown quickly. Now and then one will stick to the foil, gently peel off and turn over. Make plenty unless you lose a few. I also add them to wooden bowls filled with homemade popourri, or hang on garlands. Have fun, sing carols and enjoy a simple Christmas! Simply lovely Lori Ann. 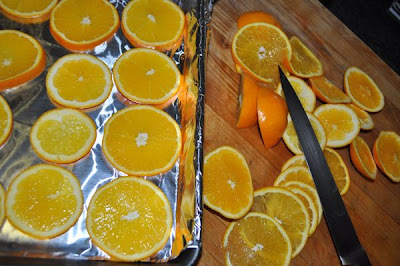 I'll bet the birdies and squirrels will love the orange slices after Christmas.